The Shadow Instrument (pictured) - a giant musical instrument which allows people to interact with sound using their shadows. A pattern of several coloured spots are projected on the floor. 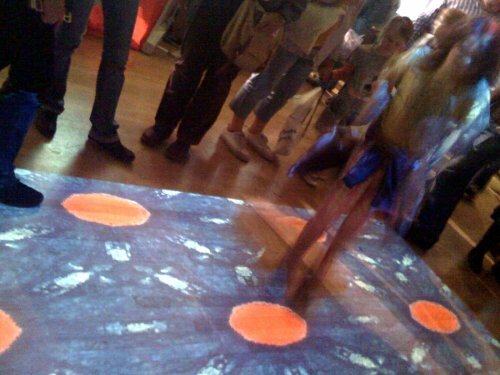 Stepping into a shape triggers sound to play creating an interactive musical space. The B-Keeper - a drum system allows you to take over the role of drums in a band and control whether the music goes at a fast or slow tempo. Over the course of the five days, over 11,000 people explored the Discover Zone. Many school groups, families and members of the general public engaged with the two exhibits which proved very popular. Many schoolchildren came back again and again!